i moved to this flat with my wife in 2007.
we have removed some walls to make the kitchen, living room and one bedroom open as one continual space. this corner on the photo is my working space. surrounded by books and cds as everywhere in the flat. computer. sound card and monitor speakers. telephone. hand write notes. spice smell from kitchen some times. We go to China, where our latest voice works as a poet, musician and critic. His poetry is surreal and concrete, energetic and full of self-irony at the same time. Yan Jun was born in 1973 in Lanzhou, China. 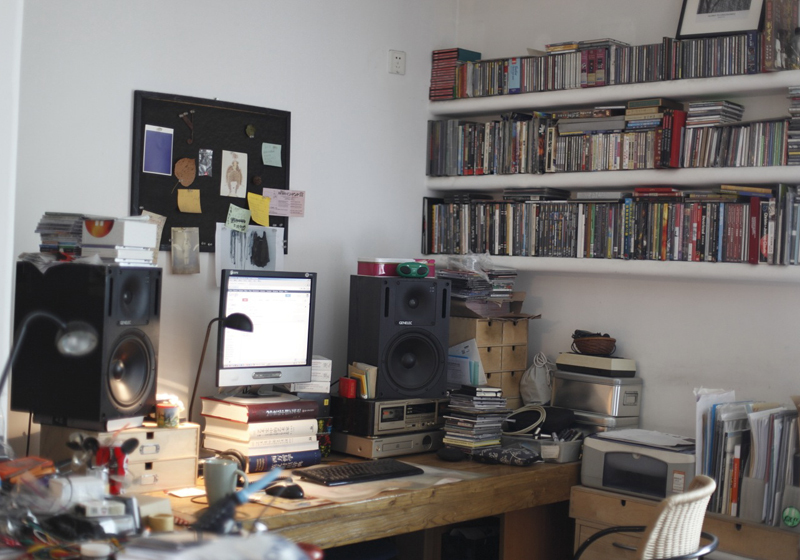 His readings are unconventional, combining poetry with electronic sound collages into what he calls ‘Hypnotic Noise’. As well as these performances, he is increasingly also doing spare readings that are minimalistically conceived.